THE GREAT WAR. In the United States, World War I has been all but forgotten, but here it is impossible to forget: the Italian-Austrian front was on these very mountains and along the nearby Piave River. Towns were reduced to rubble and their inhabitants became refugees. Many died of starvation. Those who finally did return found the forests reduced to sticks, and their fields and pastures filled with craters, debris, and unexploded munitions. 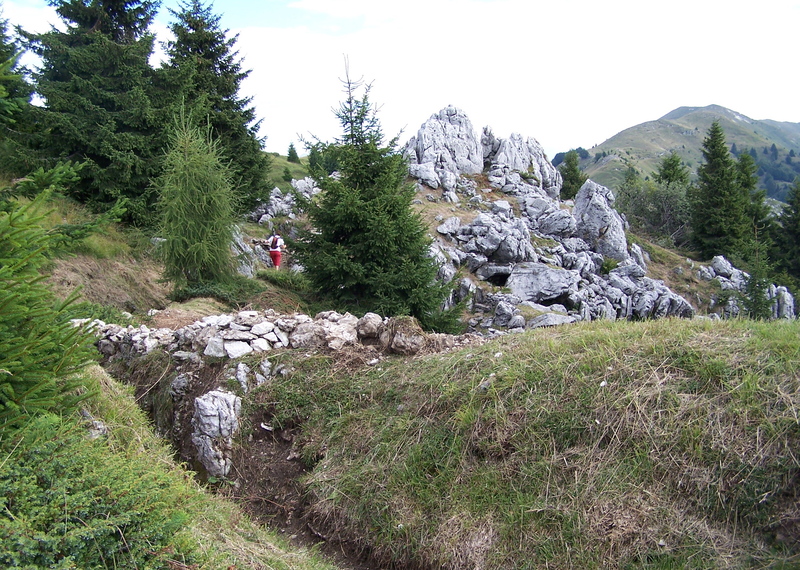 On Monte Grappa, which I see from my window, the pivotal battles of the war were fought…the battles which saved Italy. Italian soldiers endured terrible hardships, but fought with great tenacity and courage. The mountain is scarred by trenches, tunnels, and depressions caused by exploding shells. On the top there is a monumental zone which includes an ossuary containing the remains of 12,615 Italians and 10,295 Austro-Hungarians, the majority unknown. Thousands more were buried in common graves, and others continue to be found as trenches and other areas are cleared and restored. Every town has a monument to the fallen, not only from the first world war, but the second as well; other plaques and monuments honor the memory of partisans who died resisting the Nazi occupation. Memories and stories of these terrible times are very much alive in the people of this area. There are several holidays commemorating crucial, decisive events; they are celebrated with solemn rituals and prayers, not with sales and festivities. Every year on the first Sunday of August, a ceremony takes place on Monte Grappa. One week before, a torch is lit on the summit, and from it, four other torches. They are brought down the mountain, and throughout the following week, carried on foot to each of the comuni (municipalities) at the foot of the mountain. At each stop, there is a ceremony to remember and honor the fallen. Last night I went to witness the arrival of the torch in my little town. The sun was setting and all was quiet and still. Two Jeeps approached at a walking pace, followed by a small company of ex-Alpini wearing their distinctive hats with a single black feather. The torch was carried proudly by a young man with Down Syndrome. They reached the monument to the caduti (fallen) and lit our town’s torch, then the colors were raised as taps was played. It was simple, affecting, and moving. The mayor said a few words, then there were two poignant readings which were not of a nationalistic or patriotic nature, but instead, inclusive of the men of all nations who gave their lives for their homelands. The focus was on their common humanity, and the need for understanding, tolerance, and peace. On Sunday all the torches are borne back up the mountain for the ceremony, which is attended by authorities from Austria and other former enemy nations. This entry was posted in History, Monte Grappa. Bookmark the permalink.